With a massive volcanic ash plume disrupting air traffic all throughout Europe, and no end to the eruption of Eyjafjallajokull in sight, people are wondering if this eruption is in any way unusual. "Yes" says Rama Ho Lama, leader of the Washington State volcano cult, Children of the Great Firey One. Ho Lama contacted me personally this time. I did not have to seek an audience with him as I did several years ago. His aides tell me that this is a highly unusual action by their spiritual leader. "Rama speaks to no one until they have been granted an audience with His High Greatness!" says Ehu Io Mama, an acolyte of the cult. "This is unprecedented." "He is angry" says Ho Lama. 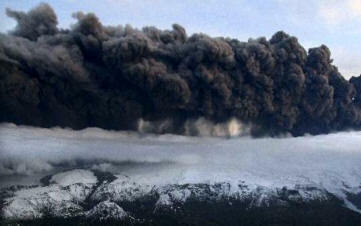 "The Icelandic people have greatly offended The Volcano God somehow, and must appease him. It may even be that all of Europe had offended The Great Firey One, and must send sacrifices to Iceland as well, but it is Iceland that he is directly afflicting at this time. I asked Ho Lama about reports of seismic activity at Hekla and Katla, two volcanoes in Iceland that are near Eyjafjallajokull, and even bigger. He told me that he had not heard of this, and became briefly silent. When he spoke again, he sounded quite concerned. "The Great Firey One is even angrier than I first thought. It will not be easy to atone for having offended him this time. Ordinary sacrifices will not be enough. It will take more! They will have to give up special people this time, and should throw Bjork into the fire. She is their most famous person. Hopefully, she would be enough to appease him." There you have it. Rama Ho Lama, leader of a volcano cult says that Iceland must sacrifice. They have angered the volcano deity, and must appease him big time. Now, he wants celebrities.